Don’t Let Dental Pain and Discomfort Ruin Your Day! When you are experiencing dental pain or discomfort, life can grind to a halt. Dental pain can be intense and debilitating, no matter the cause! At Shorewood Family Dental Care, we can help diagnose and treat your dental pain and discomfort, so don’t hesitate to call us today at 815-725-5991! We make every effort to see emergency patients the same day they call! The causes of dental pain are numerous, so it’s best that you are seen in our Shorewood office as soon as possible! Depending on what kind of pain you’re having, there are several different diagnoses and treatments that you can expect. This is by far the most common kind of dental pain and can signal quite a few problems. In many cases, a toothache is indicative of tooth decay or infection, which doesn’t mean your tooth is lost! If tooth decay hasn’t reached the soft material at the center of your teeth, then a filling can repair the damage and help resolve your symptoms. In cases where decay has reached the inner portion of your tooth, a root canal may be necessary. Despite the myths surrounding root canals, you should know that they are nowhere near as painful as the stories say! Rather, root canals can relieve the pain you are experiencing almost instantly by removing inflamed and infected tissue. 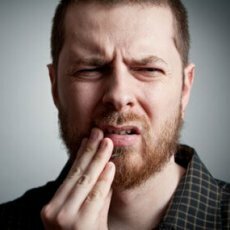 Pain and Sensitivity in Your Gums? Pain and sensitivity in your gums is often indicative of gingivitis or gum disease. Despite the frightening sounding names, both of these can often be easily treated, especially gingivitis! Using advanced laser treatments, we can even repair your gums and undo the damage caused by gum disease without making any surgical cuts! This means less healing time and a reduced risk of infection, meaning treatment is far easier for you! Sensitivity to Hot and Cold? Like ice cream but tired of trying to eat it in a way that avoids certain teeth? There are certain things you may be doing that could be causing your teeth to be more sensitive! Some highly acidic foods and drinks can contribute to enamel erosion, which can lead to sensitivity, as can brushing too hard. If you cause damage to your gums, you can have the same problems. It’s also possible that your sensitivity is due to a cavity or abscess, in which case we can treat it in our office! Because of the numerous kinds and causes of dental pain and discomfort, don’t delay an appointment! By seeing us at Shorewood Family Dental Care today, we can take away your pain and help you feel better tomorrow! Call our office at (815) 725-5991, or make an appointment using our online form. Don’t forget, we try to see all our emergency patients same day!